Greenville, SC (January 24, 2019) – Mill Village Farms and Unity Health on Main has announced they are providing relief to furloughed federal employees by providing free FoodShare produce boxes. Each FoodShare box comes with a variety of 12 seasonal, regionally grown fruits and veggies. Recipe cards are included with each order to introduce simple and easy ways to use the products in that box. FoodShare Greenville is a branch of FoodShare SC, a fresh food box program for families on a budget. Boxes retail value is approximately $25 however families can purchase every other week for $15 cash or just $5 of SNAP/EBT benefits at over a dozen medical clinics and community locations. The program began in Columbia and has distributed over 26,000 healthy produce boxes through 2018 with nearly 60% being purchased by SNAP/EBT benefits. The mission is to provide Good Healthy Food for All. The non-profit organization is also accepting tax-deductible donations directly to support this effort. They are also looking for volunteers to help pack the boxes on Wednesday, January 30th . Interested in supporting, contact the program director, Courtney Watson courtney@millcommunity.org. Eligible furloughed federal employees are allowed two boxes per family and need to be picked up between 1 and 4 pm on Wednesday, January 30th at Unity Health on Main in downtown Greenville. Supplies are limited to first 100 families unless additional funding is received. Orders are taken via the Mill Village Farms website. Mill Village Farms began as a non-profit community development organization in 2012 in the Greater Sullivan community of Greenville, South Carolina through a partnership between Long Branch Baptist Church and Grace Church. 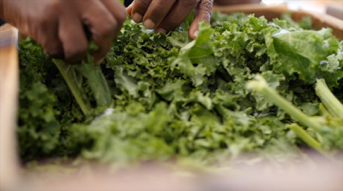 It launched Mill Village Farms to grow fresh and healthy food across our city for food-insecure communities, while also creating a platform to employ and empower local teens in basic job-skills, sustainable agriculture, and entrepreneurship. Learn more at (www.millvillagefarms.org).